Montebello log siding wall system has all the distinctive warmth, rustic style and beauty of log siding with the strength and durability of vinyl. Montebello is the low maintenance alternative to real wood. No painting, no staining and no wood preservatives required means more time to enjoy! Precisely contoured foam under-layment adds rigidity and superior impact resistance. LineLock panel locking system locks panels together for greater rigidity and stability on the wall. Ultra-Vinyl UV vinyl technology guarantees superior weatherability and color retention. 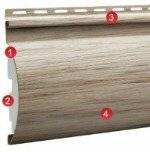 To see more information on Kaycan Vinyl Siding click here. Vinyl log siding looks just like real Cedar logs. It is less expensive than real Cedar logs, requires much less maintenance than real wood, and is resistant to rain, snow, harsh winter winds and never needs painting. The real Cedar look allows the homeowner to create that rustic outdoor look everyone loves. All without the high cost and high maintenance of cedar logs. Easy to install and can be applied by any good vinyl siding contractor. 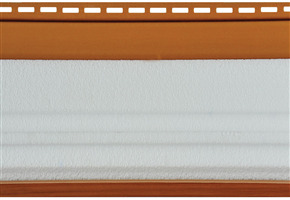 It comes with a factory applied foam layer behind the curve that add stability and strength to the panel. The foam layer also adds thermal qualities to the siding making it more energy efficient therefore saving you on your energy costs. Prices on vinyl log siding will run about $3.75 to $4.50 per square foot for the product. This usually does not cover all the labor costs involved however. 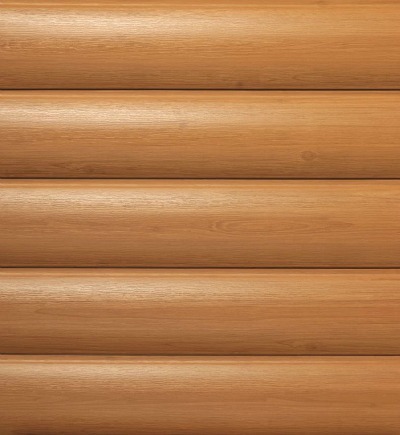 Timbermill Vinyl Log siding: $3.79 sq ft 1,800 sq ft X $3.79 = $6,822. Real Wood Siding: $4.50 sq ft 1,800 sq ft x $4.50 = $8,100. To review How To Measure Your House click here. To review some of the costs that go into installing vinyl siding click here. 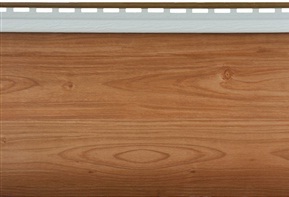 Shown here is Timbermill Stained American Cedar Color and Stained Forest Brown Color. 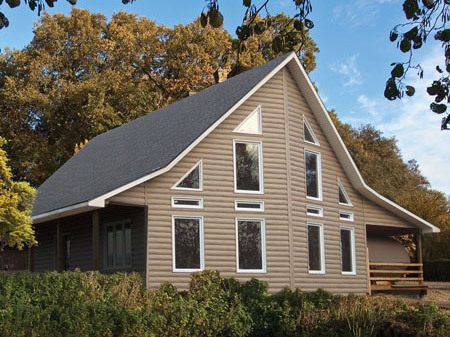 To see more information on vinyl cedar shake siding click here. Back To Home Page Vinyl Siding click here.